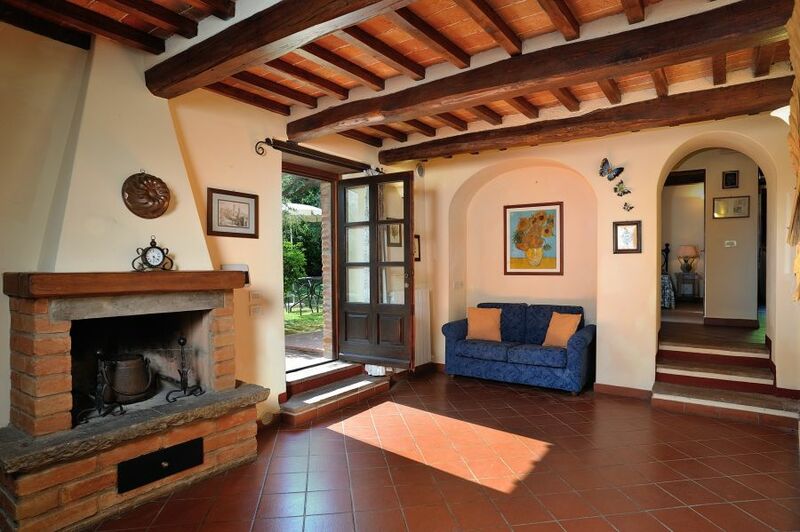 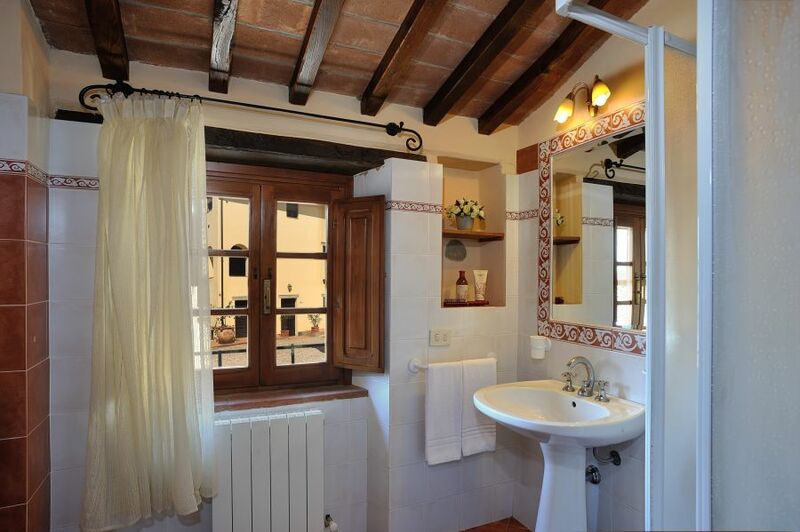 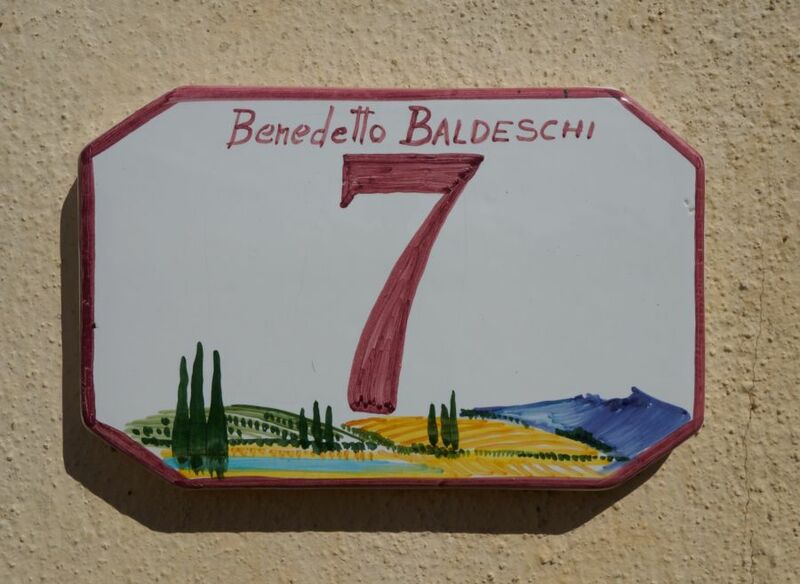 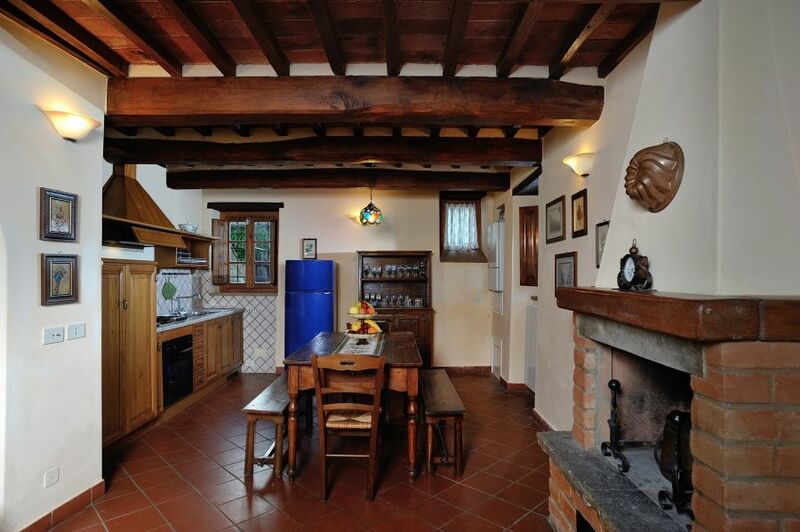 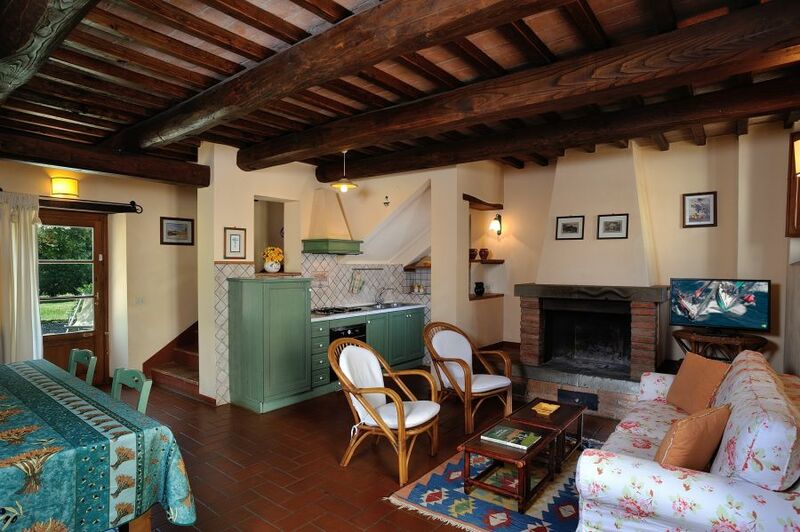 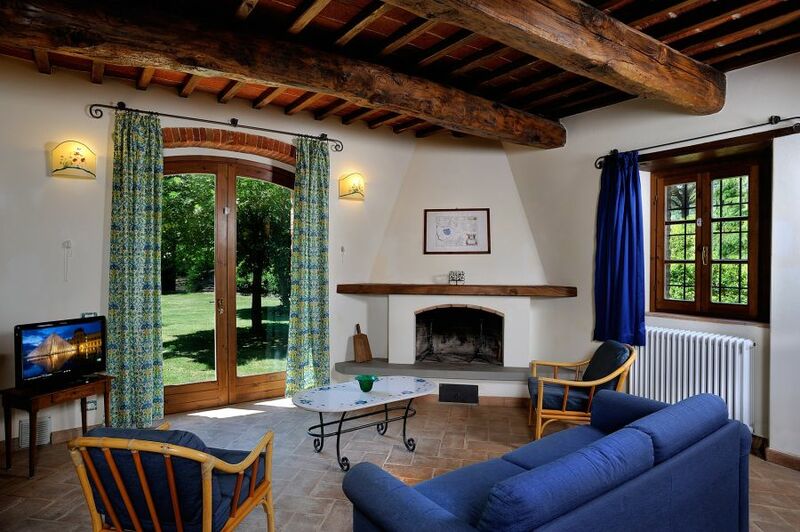 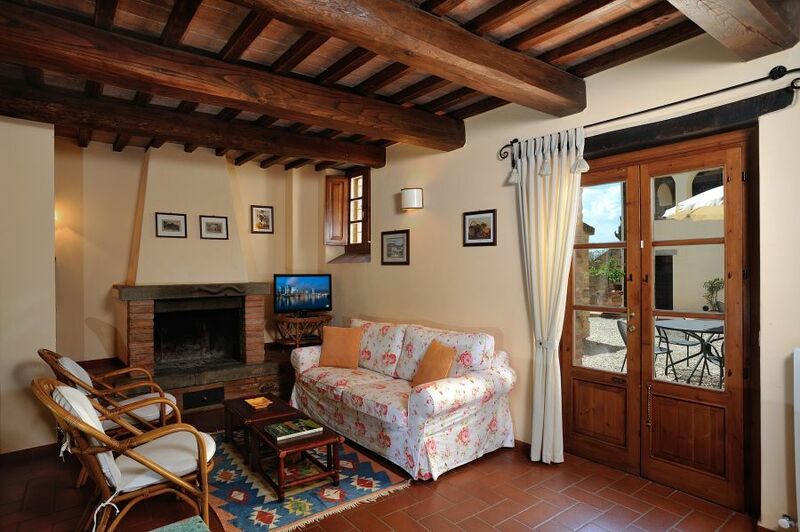 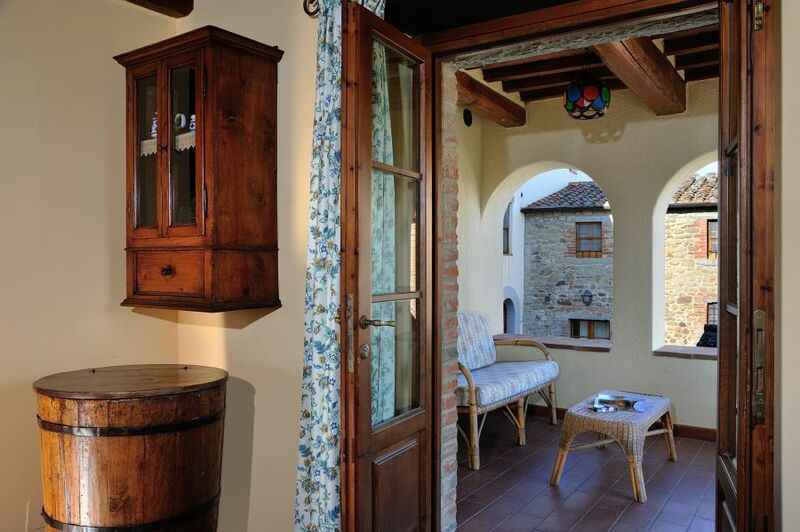 Are you looking for a vacation home close to Lake Trasimeno? 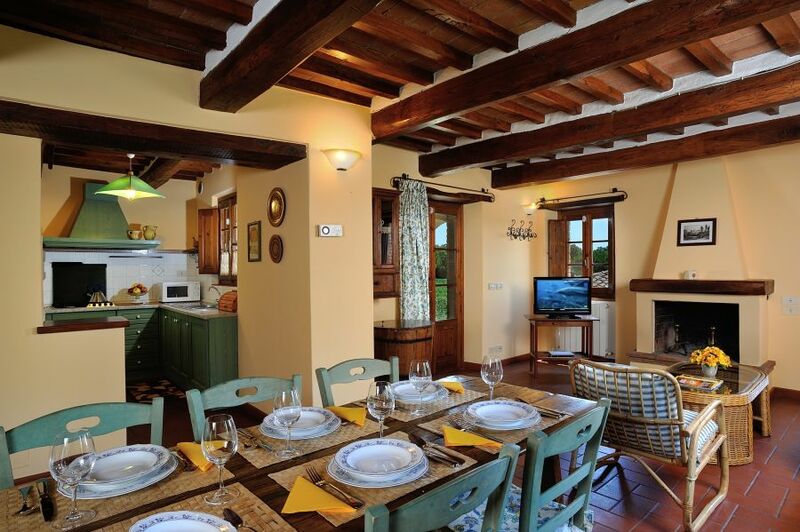 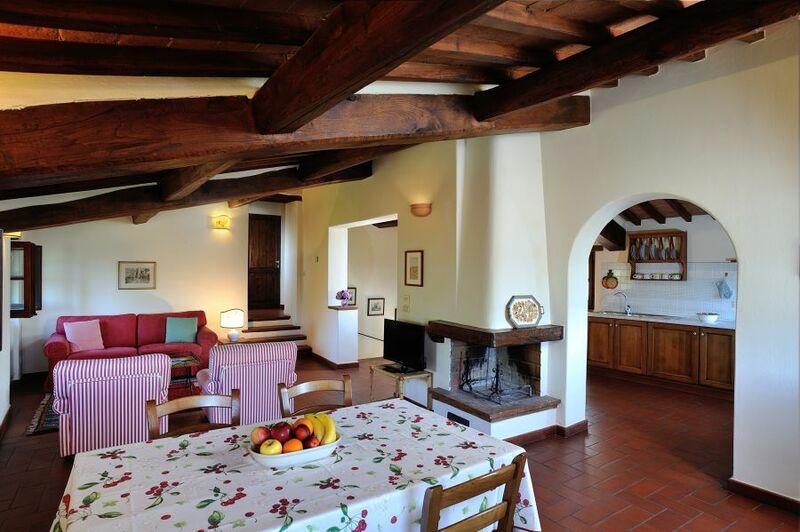 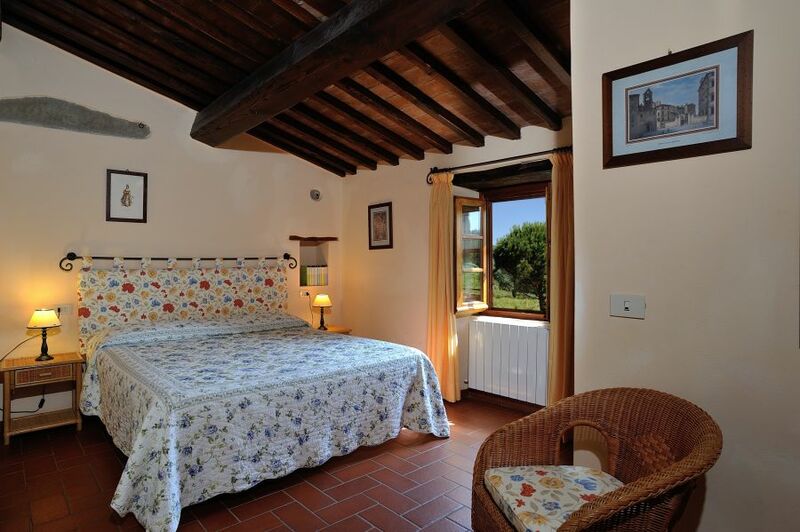 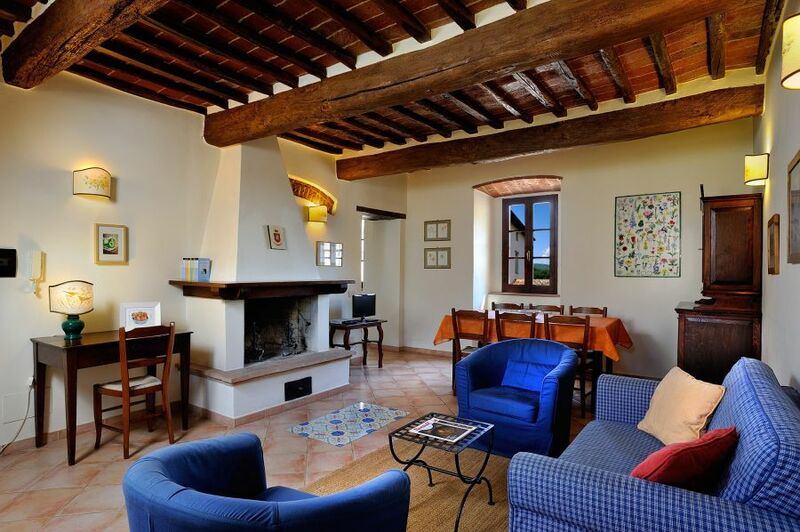 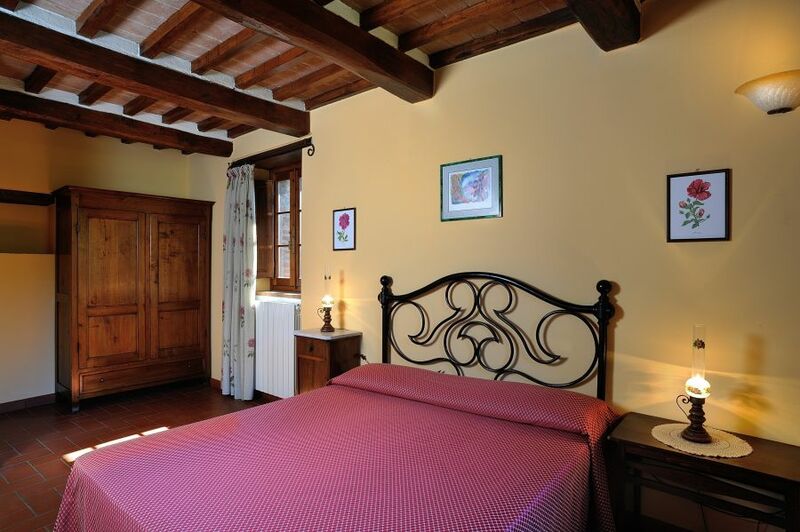 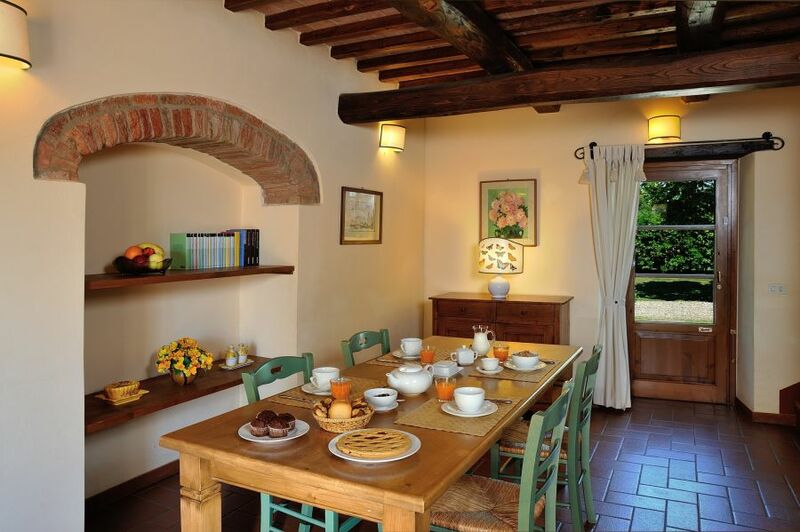 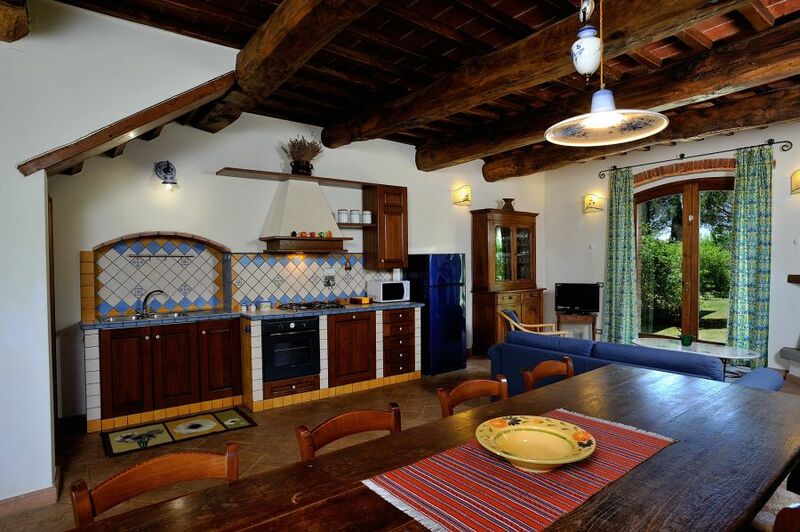 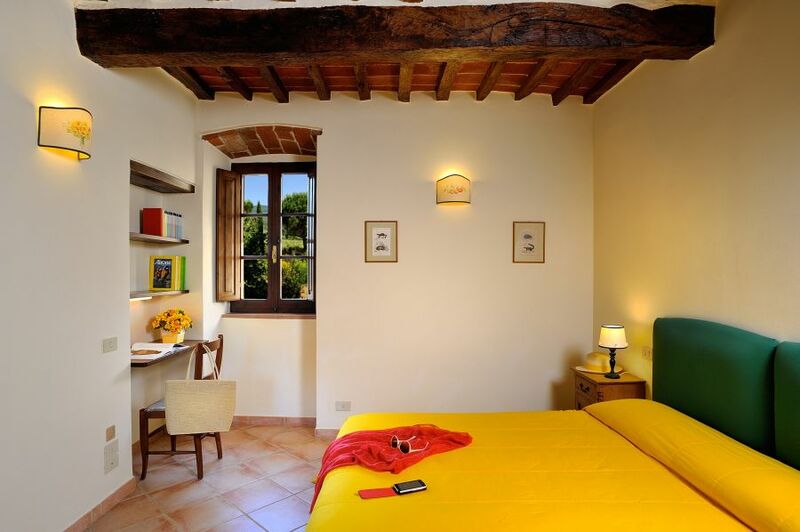 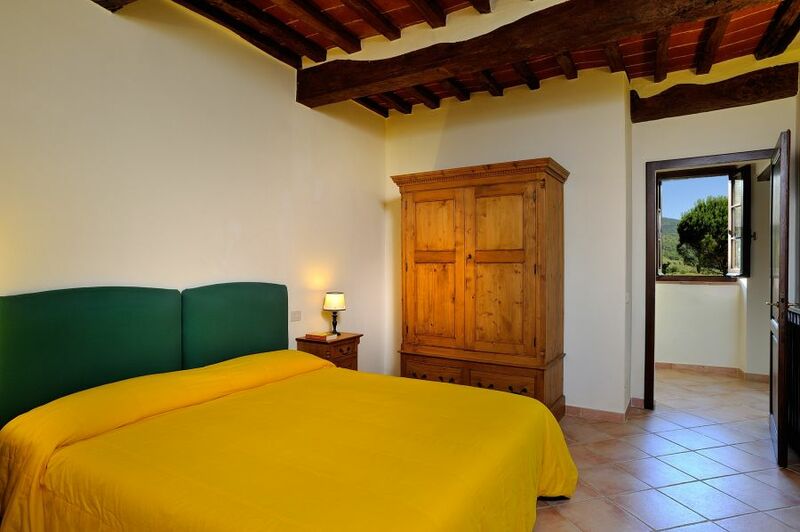 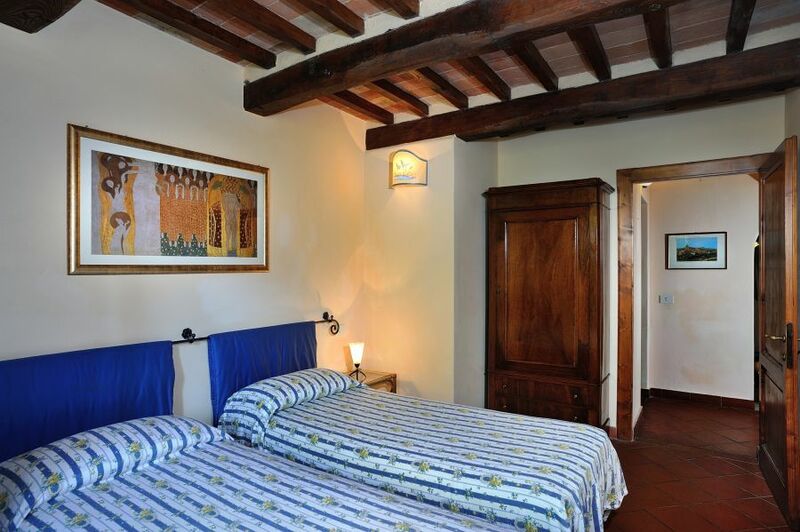 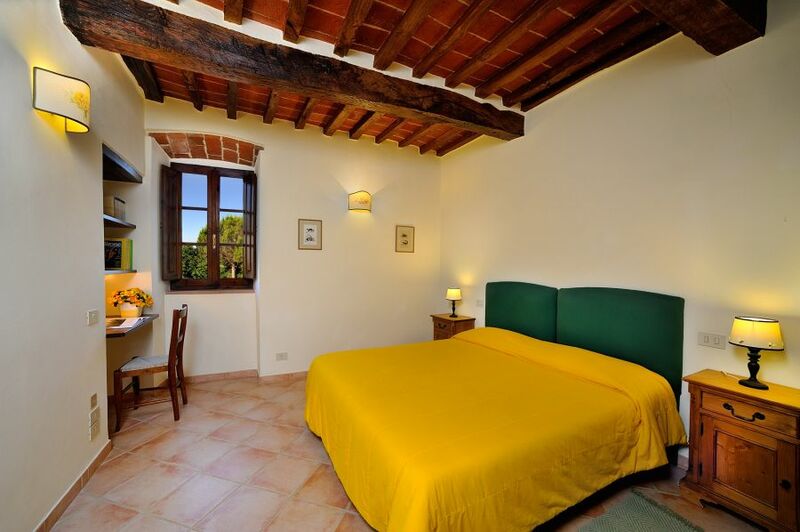 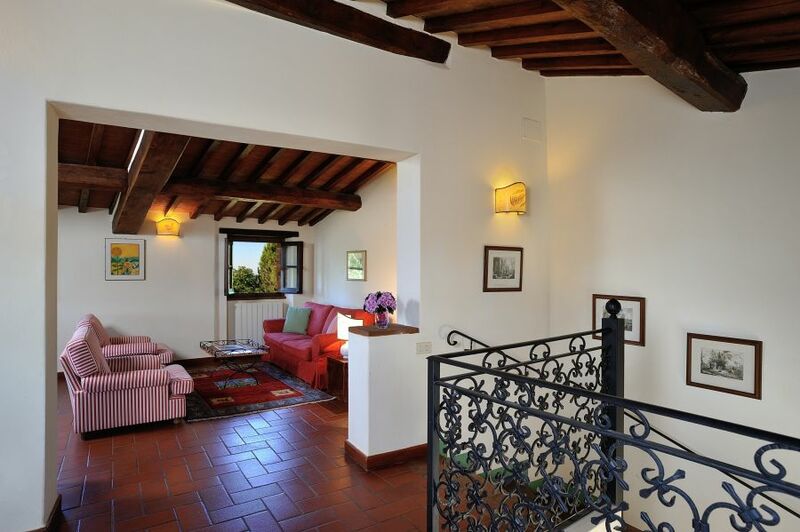 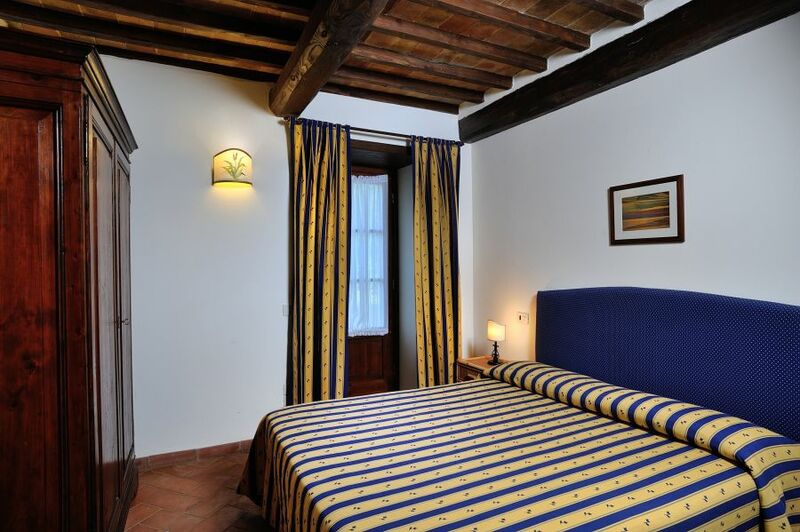 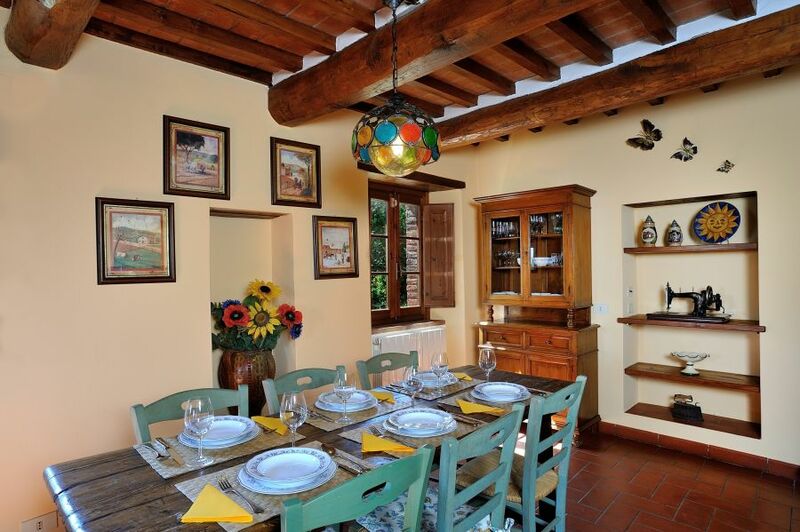 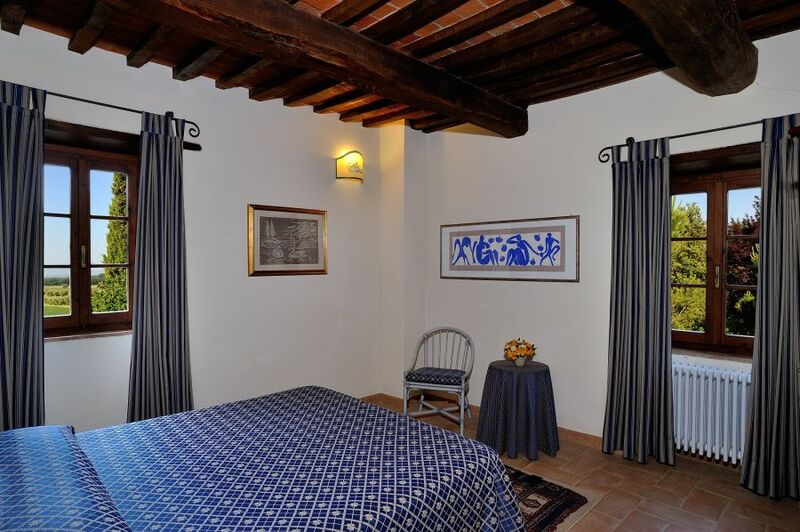 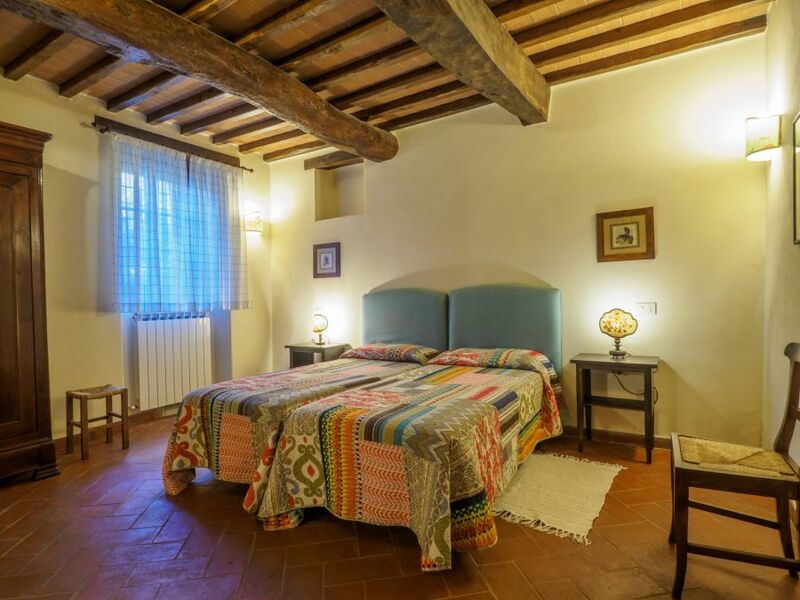 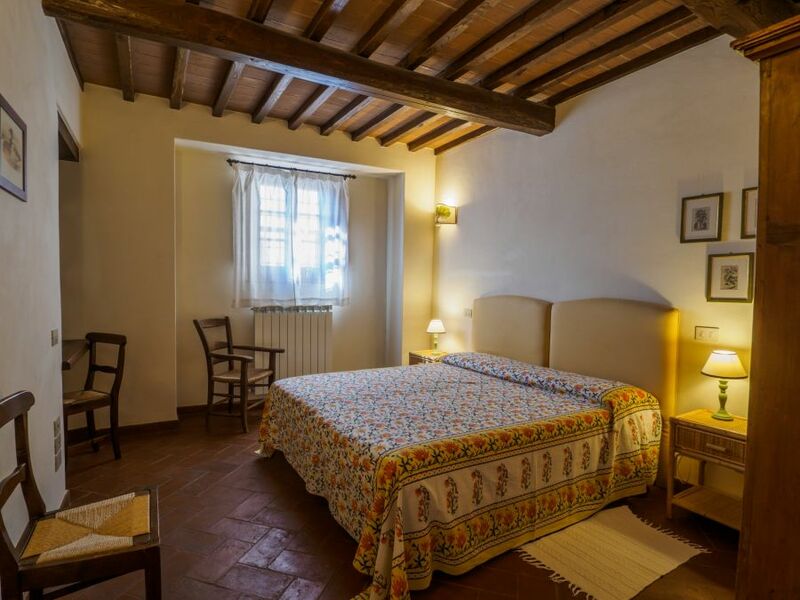 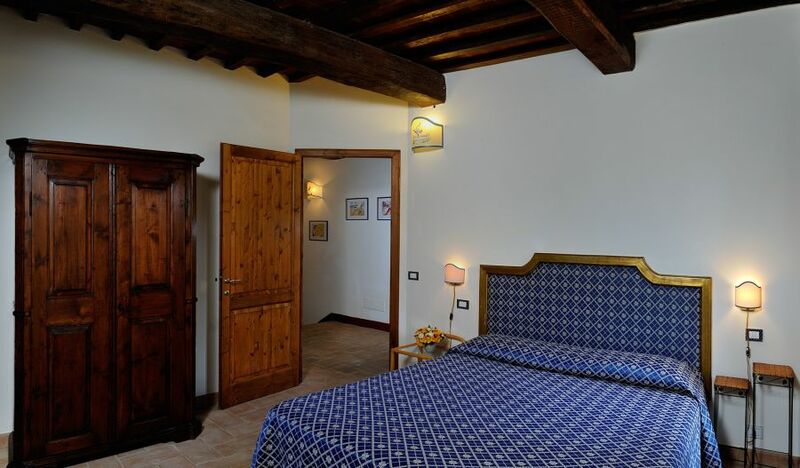 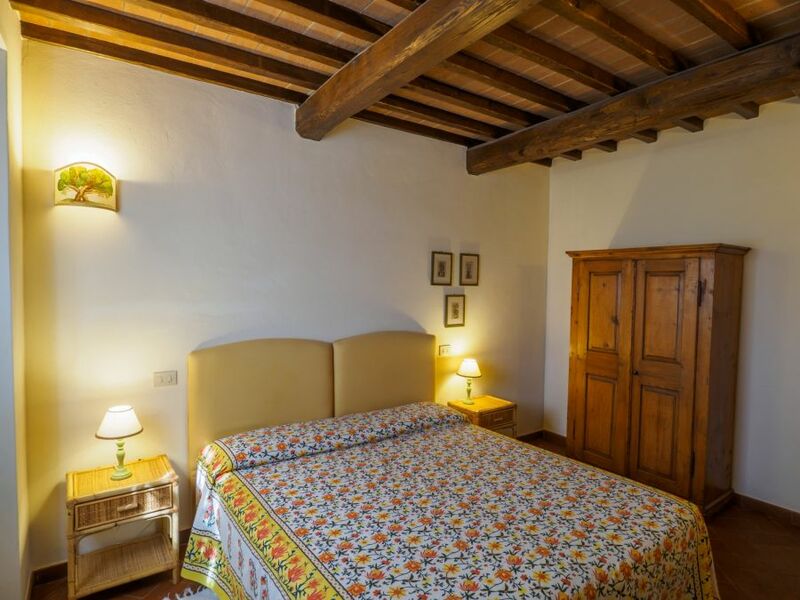 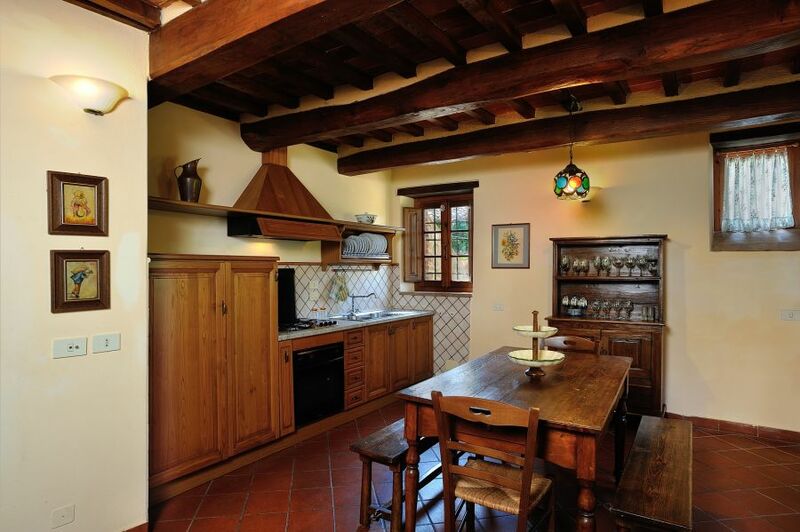 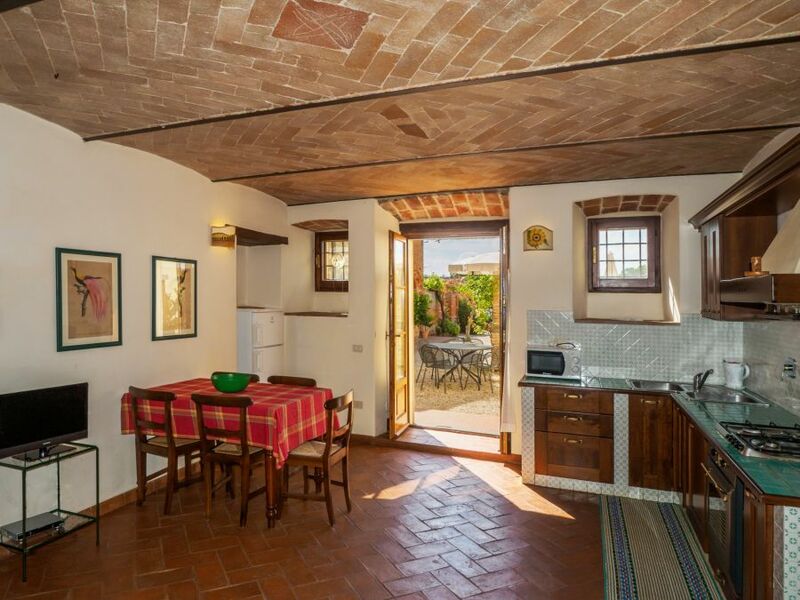 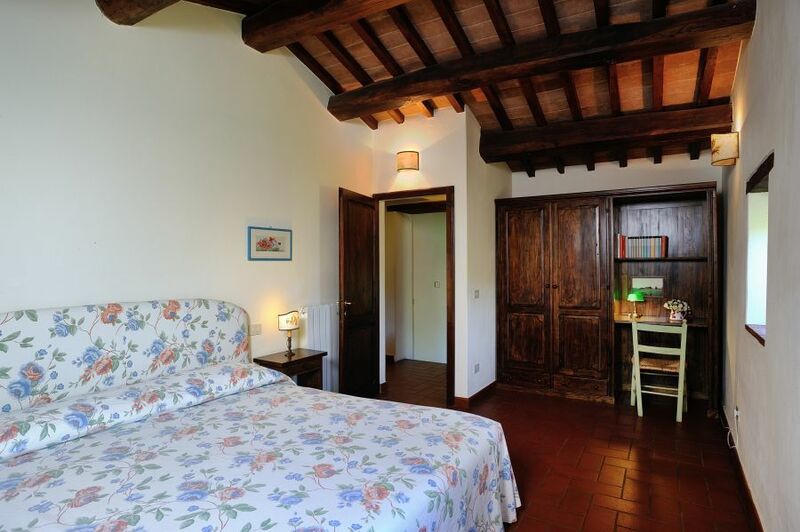 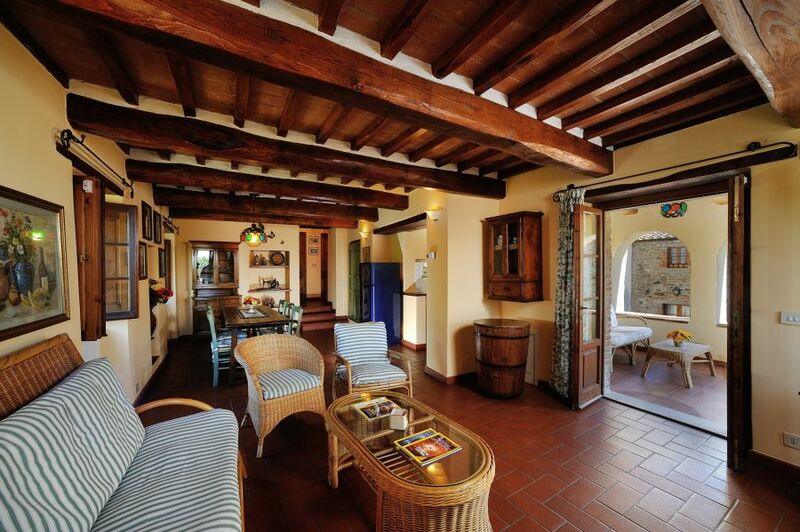 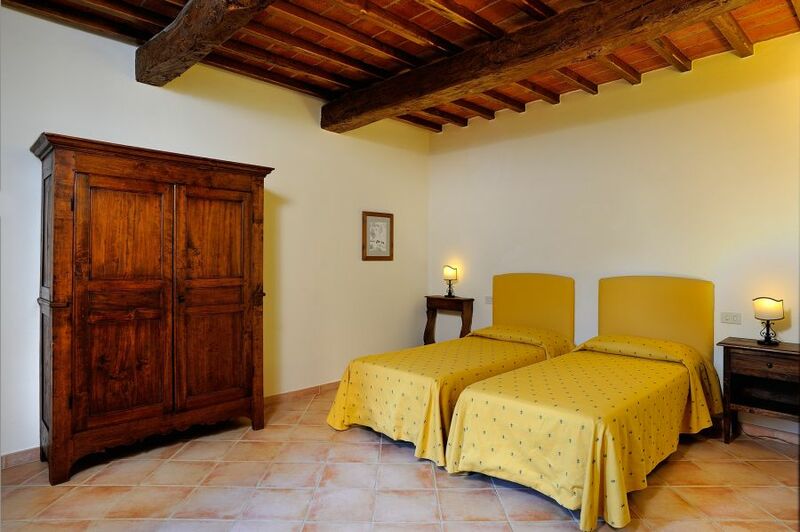 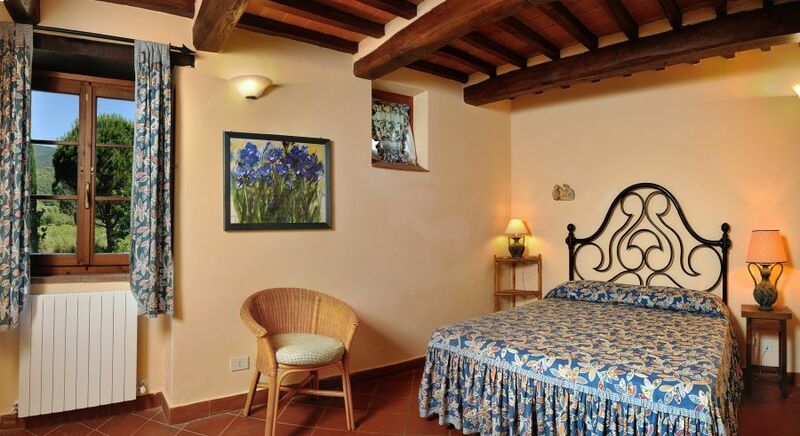 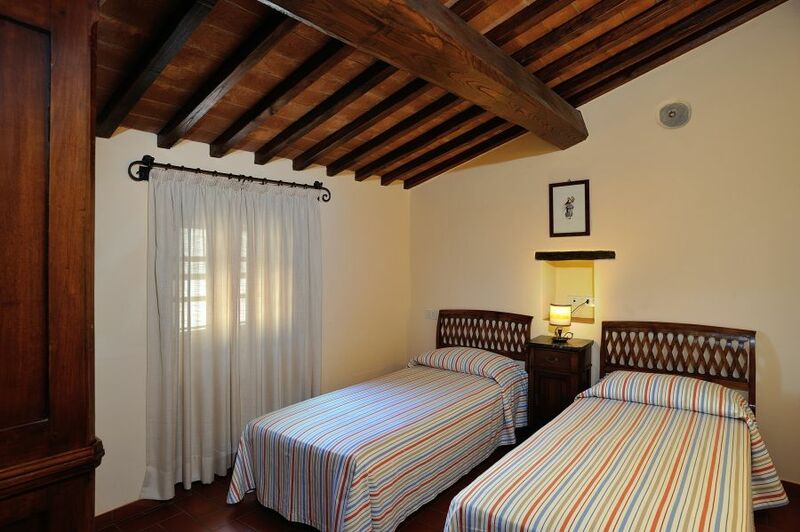 At the Farmhouse La Fattoria del Rio di Sopra you can choose from 8 spacious apartments! 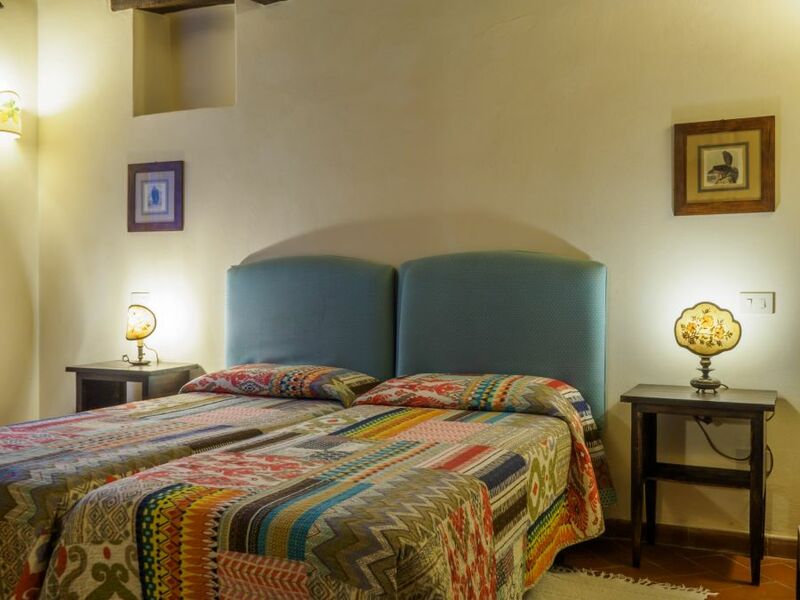 The size various but our 2 bedroom apartments are all very comfortable, tastefully decorated, equipped with all facilities, as well as the necessary outdoor space. 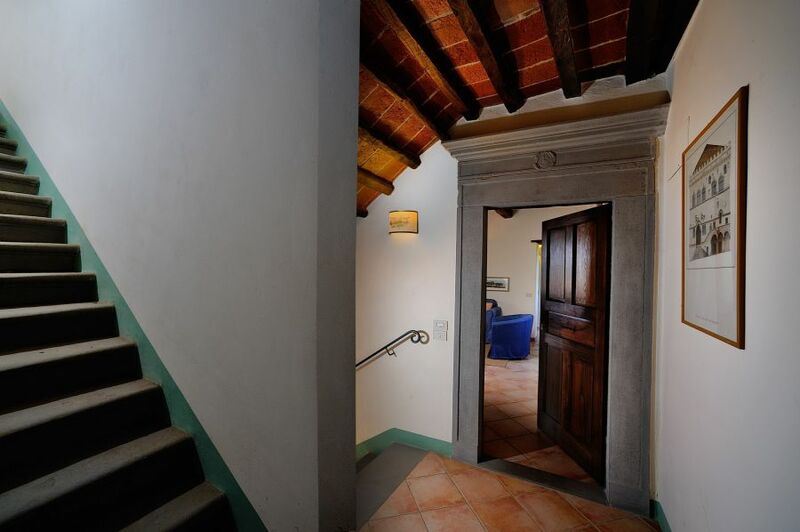 Just think that each apartment has its own unique entrance: we guarantee the utmost privacy and discretion! 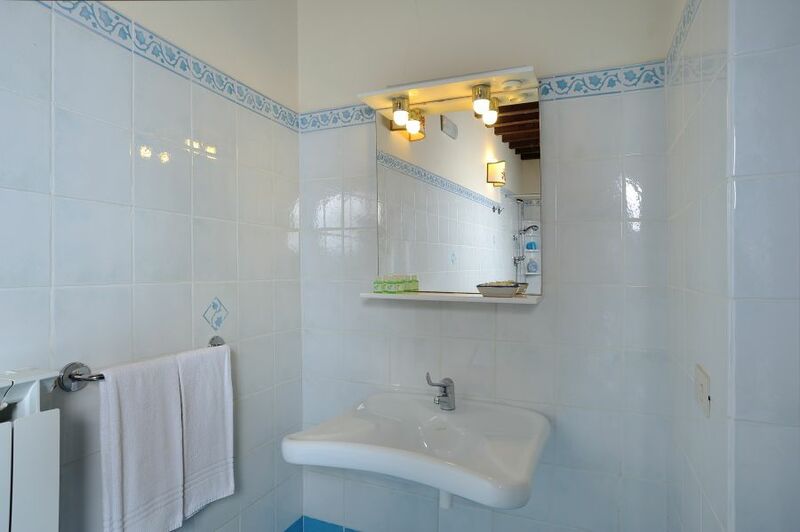 On the second floor you can find this 92 sqm two bedroom apartment, made up of a large living area with a big kitchen area, 2 queen beds and a bathroom with a private washing machine. 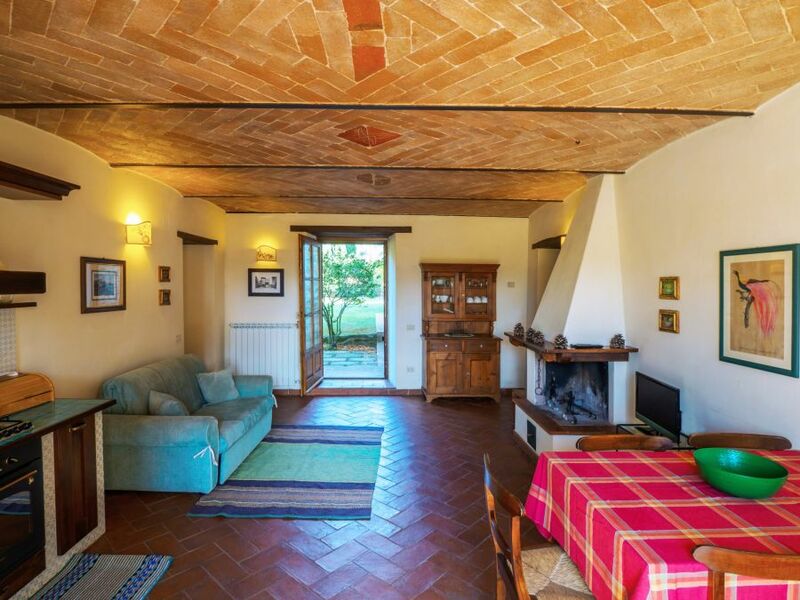 Panoramic view on the four sides of the house and a lake view. 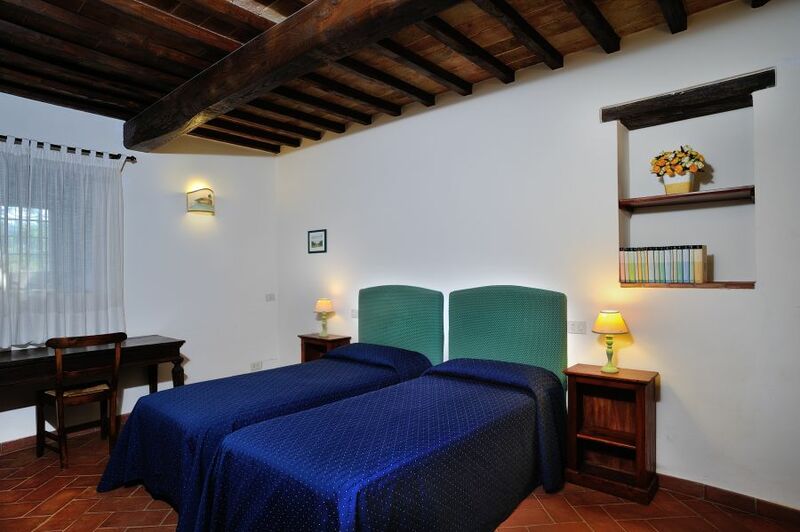 Sleeps 4+1. 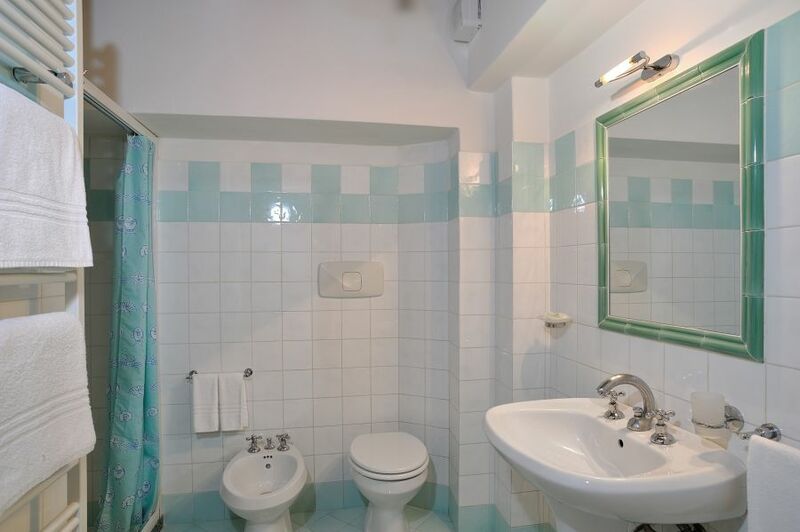 A 78 sqm two bedroom apartment located on the first floor, with a panoramic view. 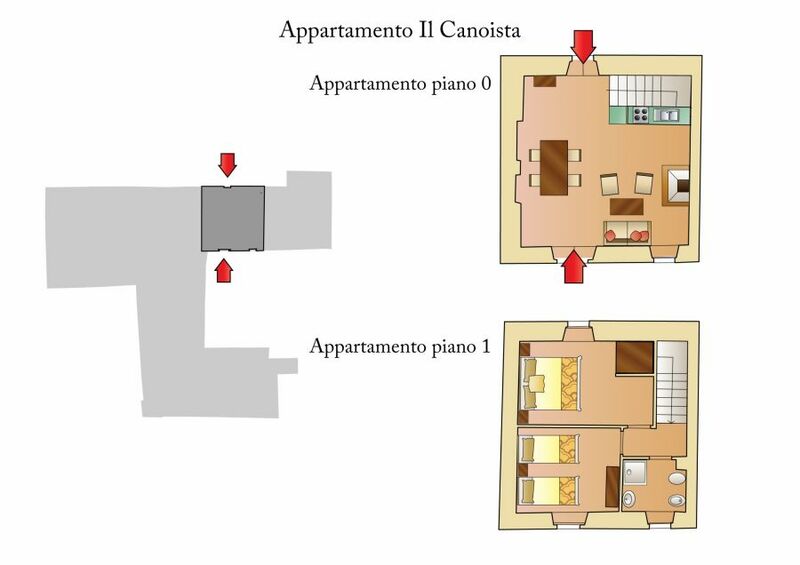 It is made up of a living room with a pull out couch, a large kitchen, a queen bedroom with a washing corner, another queen bed and bathroom. 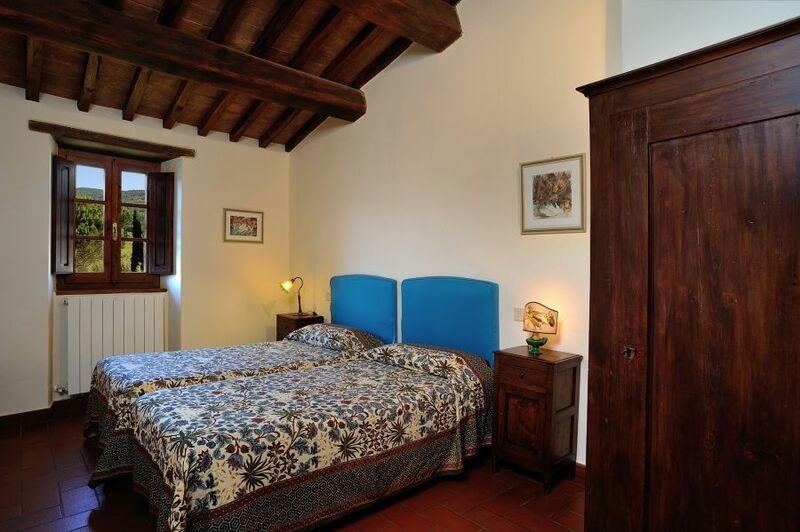 Sleeps 4+1. 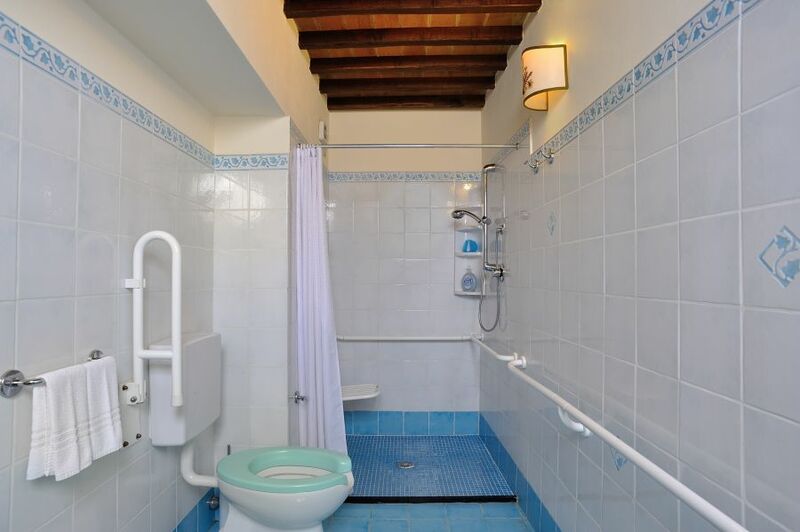 65 sqm one bedroom located on the ground floor, handicap accessible, with a private entrance and private garden, direct pool access. 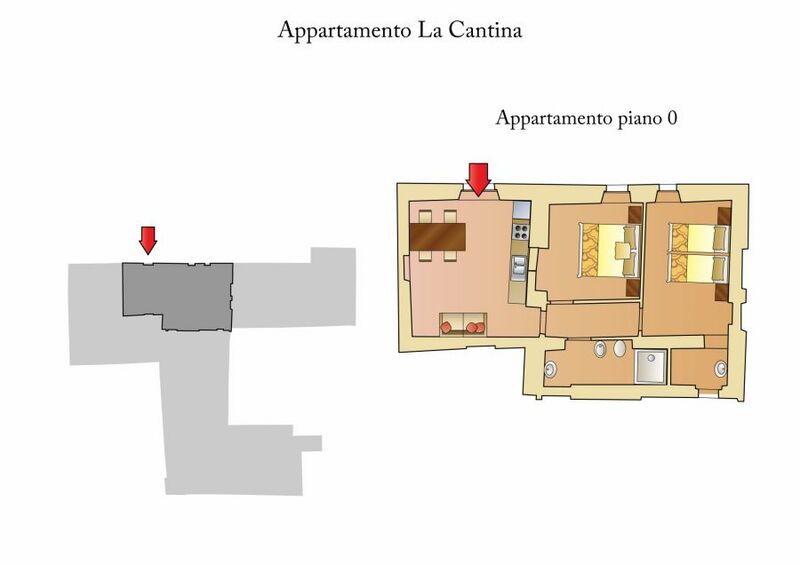 It is made up of a living room with a kitchenette and a pull out couch, a queen bedroom with a washing area, another queen bedroom and bathroom. 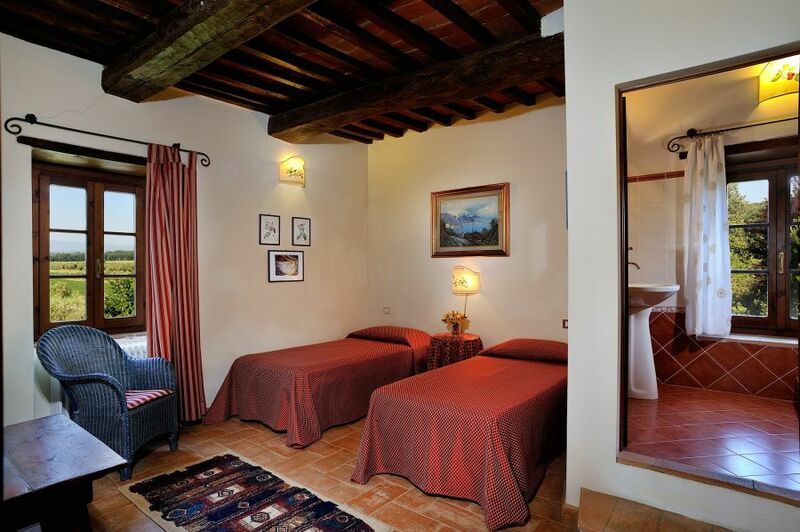 Sleeps 4+1. 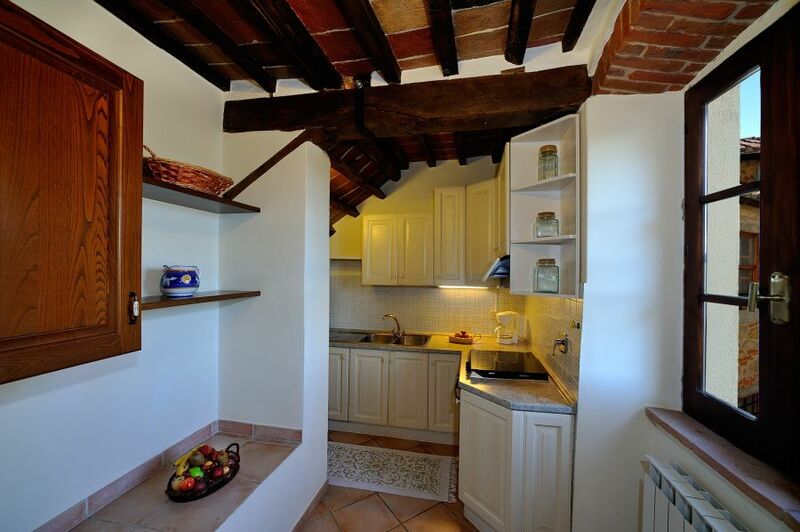 Great 70 sqm apartment, ideal for 4 people. 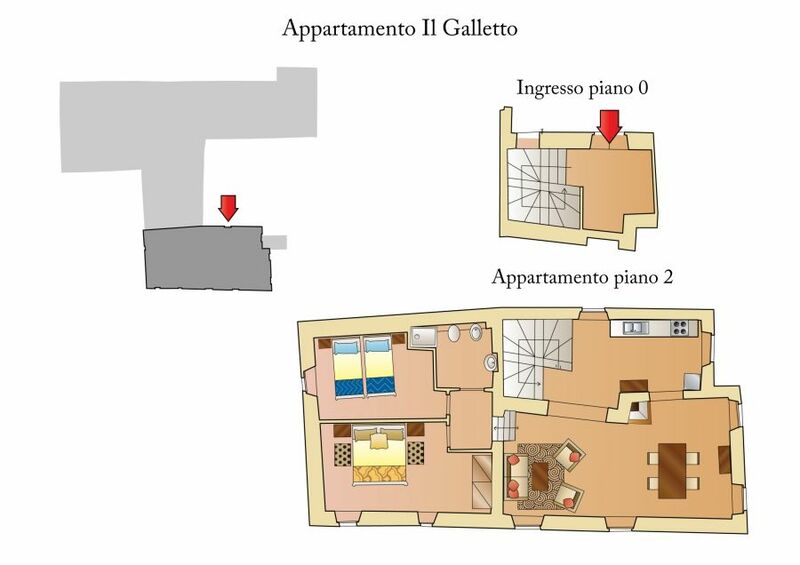 The apartment has two floors: on the ground floor, with garden access, there is a large living area with a kitchen and dining table; on the first floor there are two bedrooms (one with a queen size bed and a lake and garden view, the other has two twin beds and a view of the courtyard). 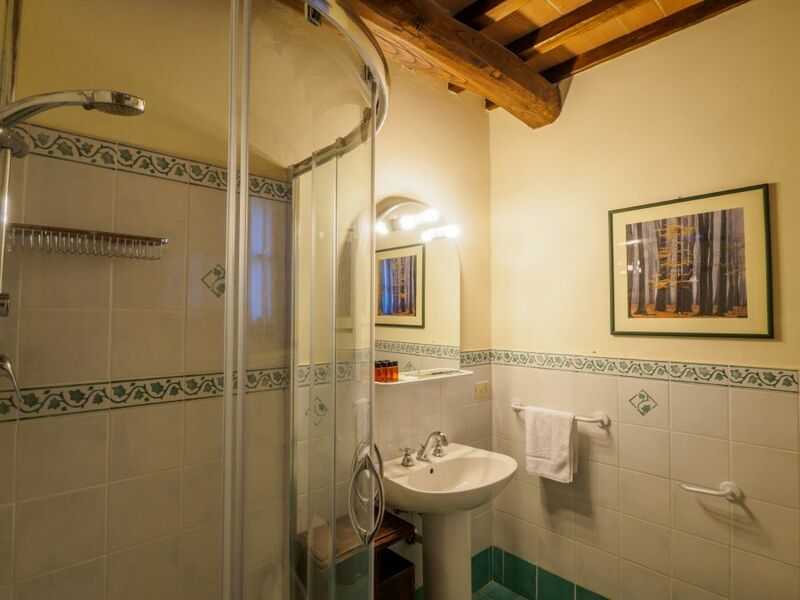 The bathroom located on the first floor has a comfortable shower. 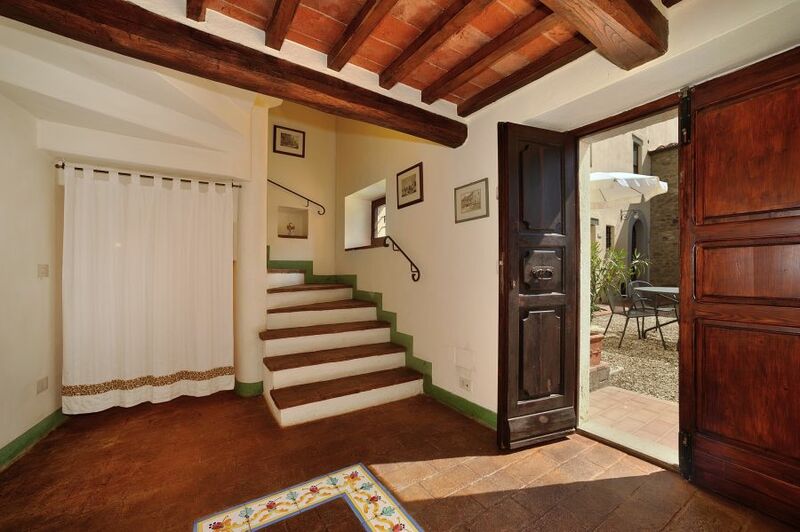 On the first floor, with windows that look out on the garden and the courtyard. 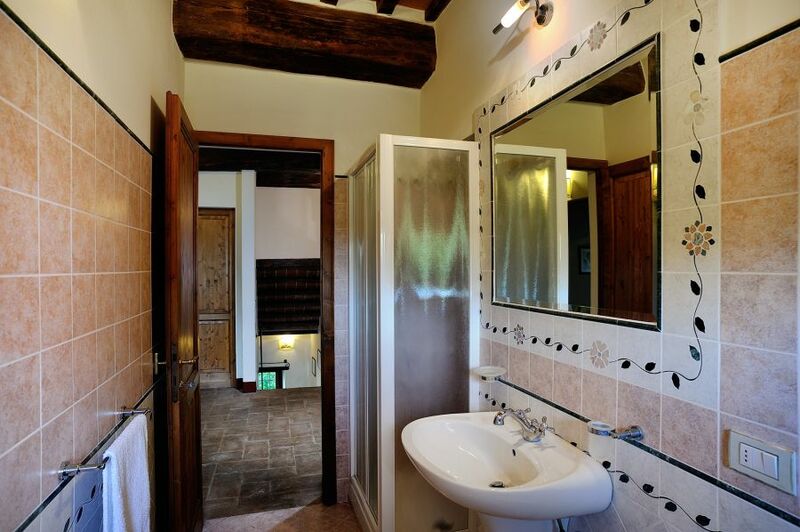 Tile floors, large living area with fireplace, 2 large bedrooms and 1 bathroom. 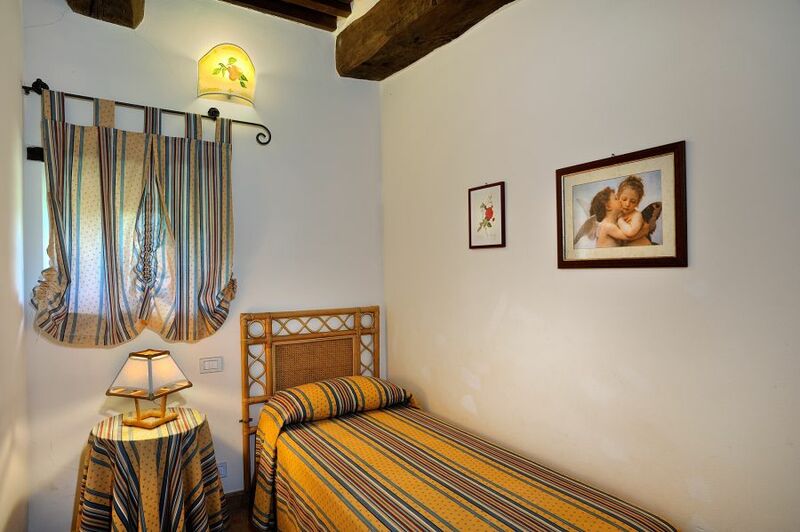 Small private lodge with armchairs. 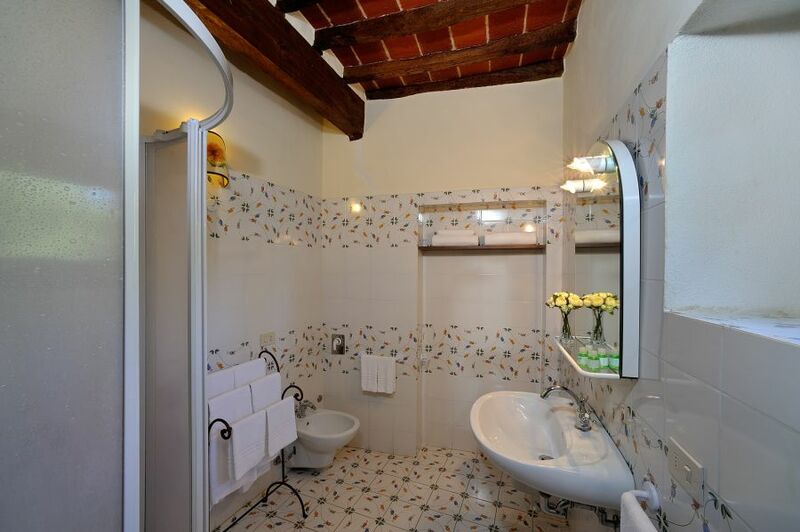 This apartment has two different private entries, one of which directly from the pool area. 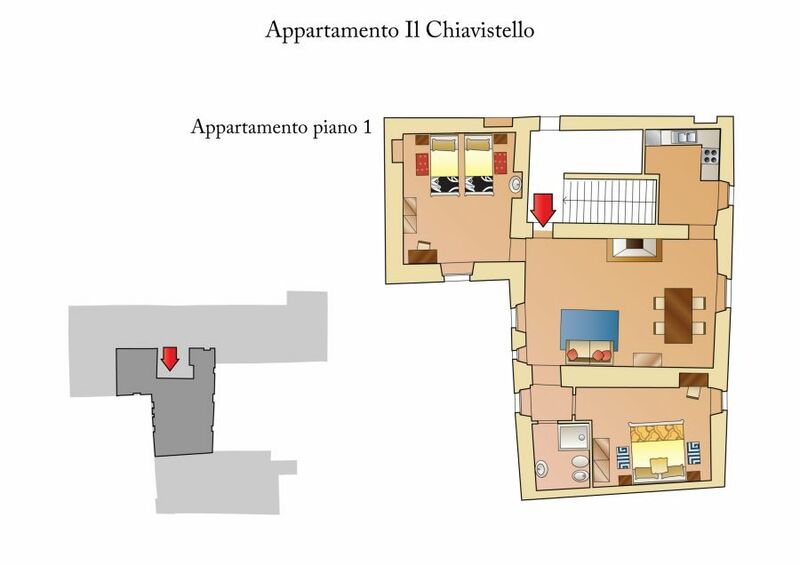 It has two floors: the ground floor and the first floor. 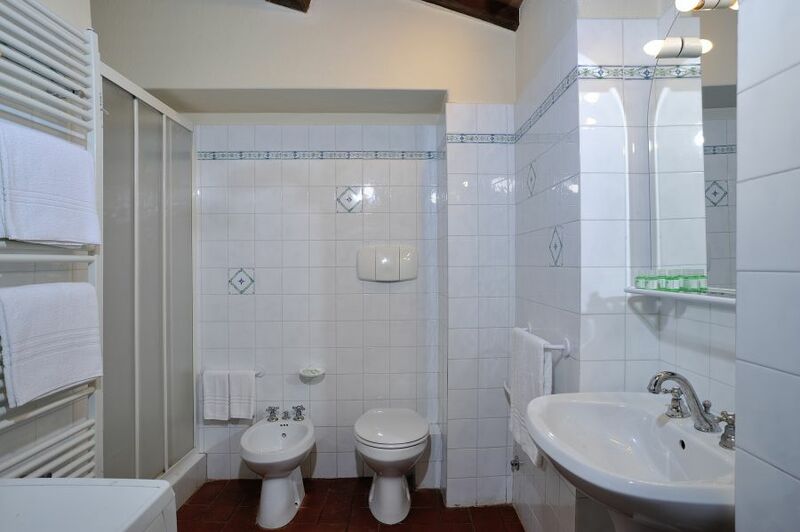 On the first floor there are two bedrooms (queen and double), a small bedroom (single use) and 2 bathrooms with a shower. 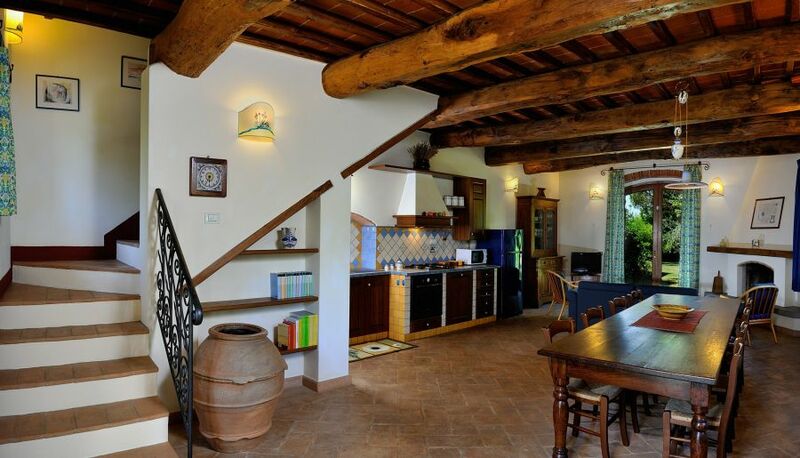 On the ground floor there is a really large living area with a den, kitchen and large dining table. 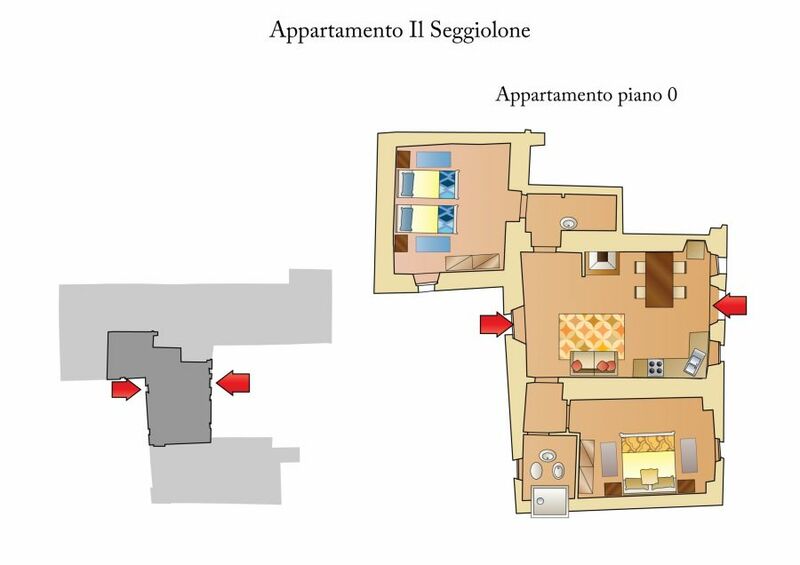 An apartment appreciated for its privacy, thanks to its entry on one side of the building, with a large portion of garden in front. 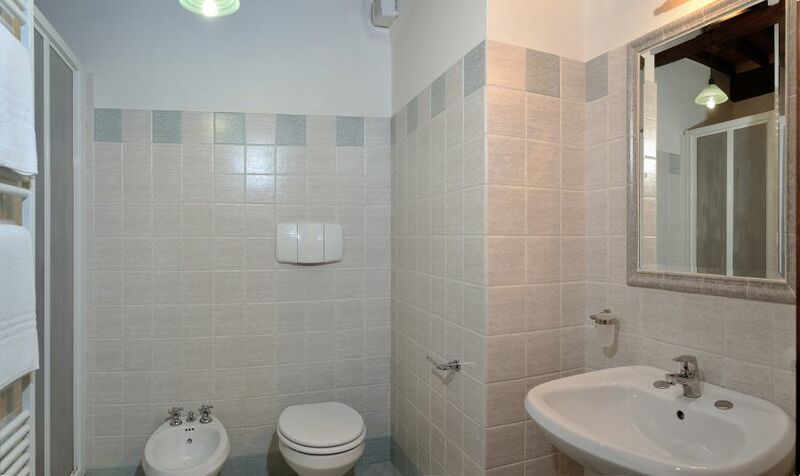 It is located on the ground floor and is made up of a living area, kitchen, 2 bedrooms (queen and double) and a bathroom with a shower. 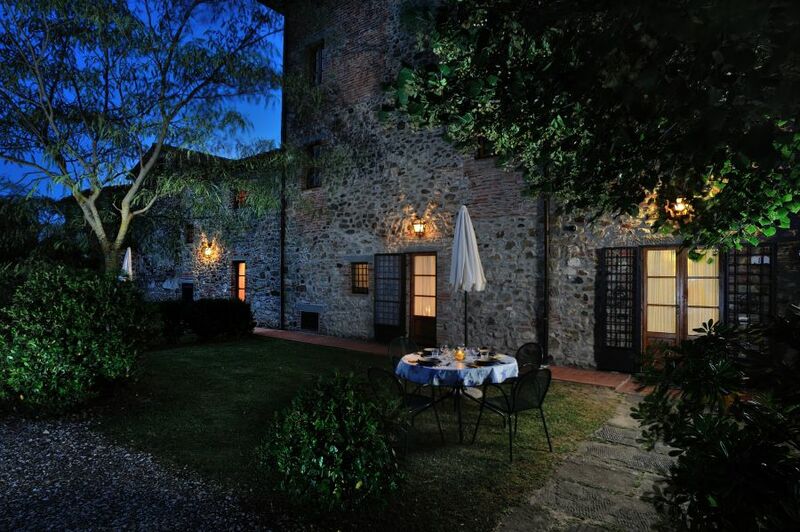 The garden in front has a table and chairs for relaxing. 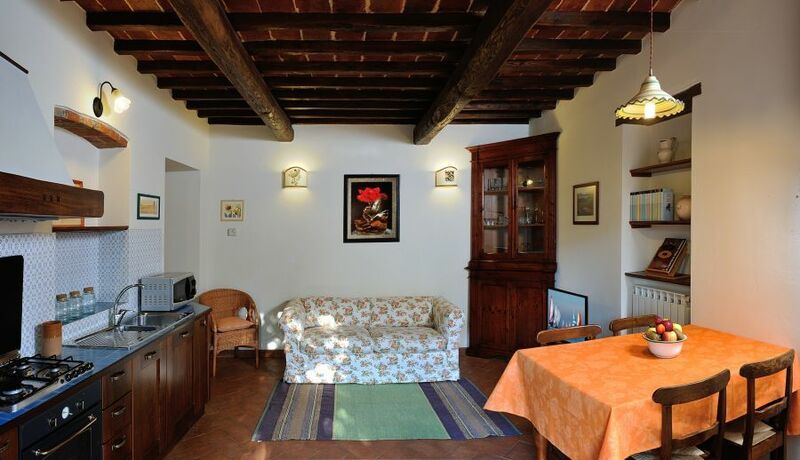 Just rent the apartment or apartments (if you are traveling with a couple friends) that you prefer and you will see how wonderful your holiday at Lake Trasimeno and surroundings is! 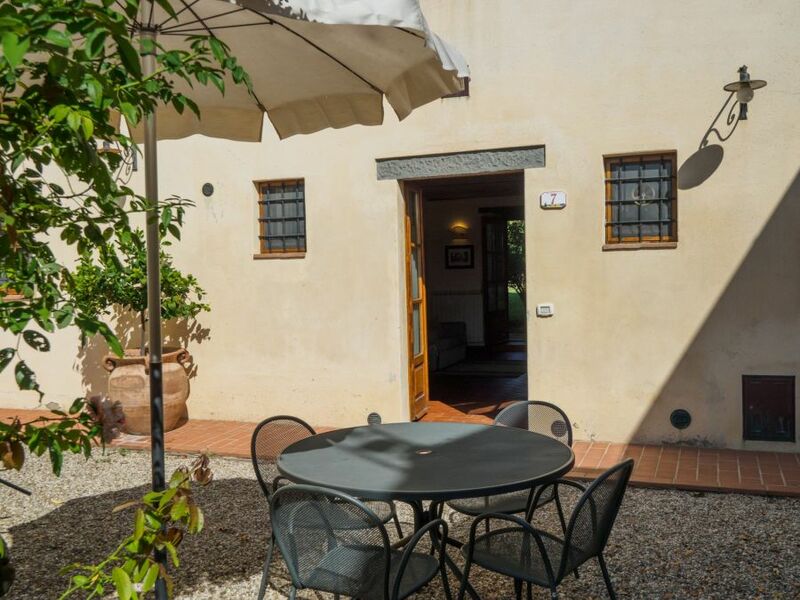 Here you are in a quiet area surrounded by green by at the same time can easily reach Perugia, Assisi, Gubbio as well as Cortona, Arezzo, Siena, Montepulciano or Pienza! 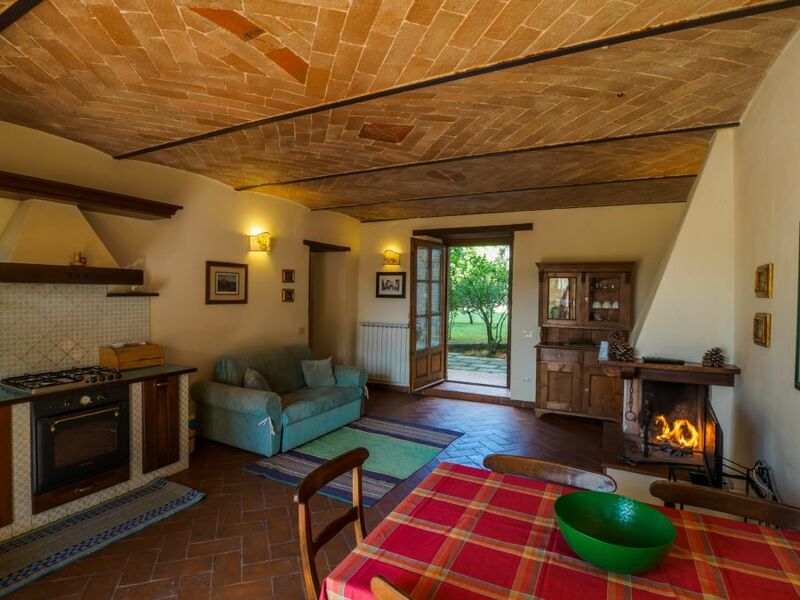 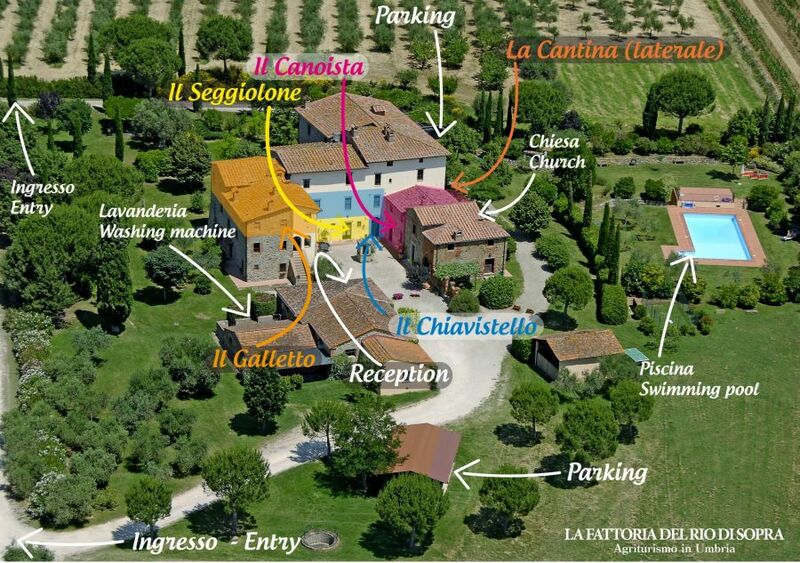 Basically all the beauty of a vacation home between Umbria and Tuscany!